The San (Bushmen) are the oldest ethnic group in Namibia. It is estimated that they have inhabited Southern Africa for more than 20,000 years. The South African “homeland” policy forced them to settle in remote “Bushmanland”, a desert-like area between Kaudom Park and Omaheke. It can be accessed on the C44, which turns off the B8 north of Grootfontein and leads 250 km to Tsumkwe, the former district capital of Bushmanland. 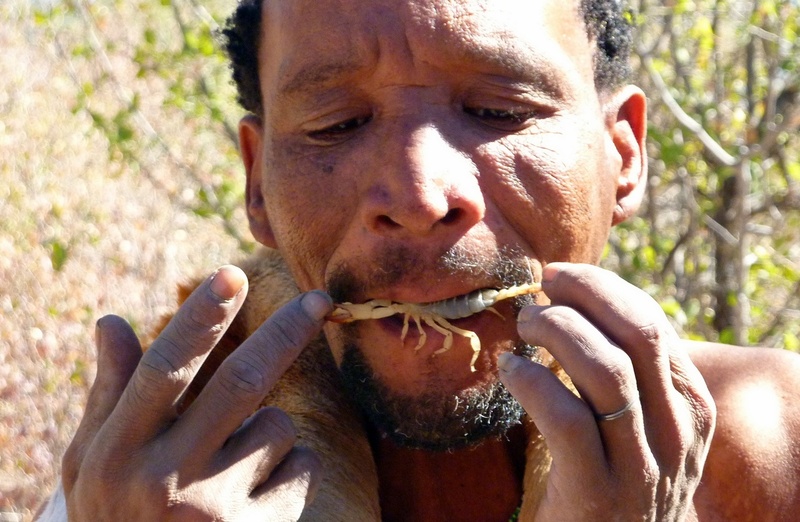 Like the Himba of Koakoland the San people still live a traditional life as hunters and gatherers. Whereas the women collect wild fruits, berries and wild onions rich in starch, the men pursue hunting. The San have a deep understanding of nature and ecology. They are able to identify hundreds of plant species and are known to be excellent animal trackers. The area is very rich in wildlife. One best attraction is that some San tribes like the the Ju/’hoansi let you take part in some of their traditional activities. You can go hunting together with the men for springhare, go elephant tracking, or watch the women gathering and preparing seeds and plants. Either Vic Falls or back back to Rundu.